2014 is notable for a number of centenaries. The outbreak of World War I is probably the most obvious of these, but the Nobel Prize in physics being awarded to Max von Laue for his work on X-ray diffraction is also worthy of a mention. One centenary that is almost lost to history is the publication of a paper  by a paediatrician called Albert Niemann, describing a disease that would later take his name. A subsequent study of the pathology of this condition was published in the 1920s  by Ludwig Pick. The condition is now known as Niemann-Pick disease (NPD). The hundred years since its description has allowed much time for NPD to be tested and recorded, as well as individual cases being brought to public attention. The disease is most common in Ashkenazi Jews, who also have the highest incidence of another lipid-based genetic disorder – Tay-Sachs disease. NPD is caused by mutation in the SMPD1 gene . A number of different mutations in this gene that cause NPD have been found, several only very recently [4,5]. These mutations mean that the enzyme called sphingomyelin phosphodiesterase is not produced correctly. This enzyme breaks down a lipid called sphingomyelin (Figure) and so without a functional enzyme, this lipid builds up. Figure. The structure of sphingomyelin. 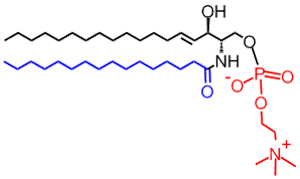 The red portion is the choline head group that this lipid shares with phosphatidylcholine. Image courtesy of Lipidmaps. The build-up of sphingomyelins that characterises NPD occurs principally in the liver and spleen. This makes the middle-abdomen engorged and is the principle cause of death in NPD sufferers. Some treatment is available for the symptoms, and others are at the research stage, but currently no cure is available. The severest cases lead to death before the age of two. Patients with a less severe case and ones in which treatment has been administered, have been known to live into early adulthood . The universally negative prognosis for this condition invites interest from scientists, charities and news organisations alike. Scientific research, such as that conducted at a laboratory in Texas  is beginning to provide clues to therapeutic approaches, but despite this effort, a cure is not yet available. Such rare genetic diseases have a clear emotional impact on a family and thus raise human interest. This also means that they often catch the attention of the mainstream press, such as an article in the Telegraph and one in the Daily Mail. The latter report handled the story with what appears to be uncharacteristic balance and restraint, both to the patient and those close to him, and to the science that underpins what we understand of the disease. It is easy to see that the human-interest factor in these stories makes them ripe for public attention by commercial newspapers. But is that the only factor that should be considered? A more thoughtful point of view might be that the affliction of a rare genetic disease first described a century ago, on individuals not in the public eye, is at odds with the journalistic definition of news. Although this may be a fair comment, it does not say anything about the quality of the reporting of these stories. The clinical and scientific knowledge that underpins these reports has been represented reasonably well in some cases. The science has not been neglected or twisted for the sake of added drama although some coverage has used unnecessary soundbites for effect, e.g. “Childhood Alzheimers”. The relatively good journalistic handling of the underlying causes of NPD means it has fared better than other stories with a scientific or medical background. The reporting of an observational study  on diet and health, left many scientists flabbergasted if not outraged. The reporting was negligent and unworthy of the organisation from which it came. However, though also flawed, the study that was being reported on was new and dealt with an issue that affects millions of people world-wide (obesity) making it newsworthy. So, on one hand, we have reports of heart-breakingly emotional stories about individuals in which well-established science is reported soundly. On the other there is poor reporting of flawed science that may affect millions of people, albeit without tensioned heartstrings. Perhaps we need a level of human interest in any given story to ensure good reporting of science. Or perhaps the difference between childhood death from incurable genetic disease and obesity can be summed up as “one death is a tragedy, one million deaths is a statistic”? A. Niemann, Jahrbuch für Kinderheilkunde und physische Erziehung, 1914, 79, 1–10. L. Pick, Ergebnisse der inneren Medizin und Kinderheilkunde, 1926, 29, 519–627. M. W. Spence, J. W. Callahan. “Sphingomyelin-cholesterol lipidoses: The Niemann-Pick group of diseases” in The Metabolic Basis of Inherited Diseases, volume 2. Edited by C. R. Striver. A. I,. Beaudet, W. S. Sly, and D. Valle. Eighth edition, 1989, 0070607303. P. Irun, M. Mallén, C. Dominguez, V. Rodriguez-Sureda, L. A. Alvarez-Sala, N. Arslan, N. Bermejo, C. Guerrero, I. Perez de Soto, L. Villalón, P. Giraldo, M. Pocovi. Clinical Genetics, 2013, 84, 356-361. A. Aykut, E. Karaca, H. Onay, S. Kalkan Ucar, M. Coker, O. Cogulu, F. Ozkinay. Gene, 2013, 526, 484-486.